This Saturday night Tony Bellew and Oleksandr Usyk meet for all the marbles live on Sky Sports Box Office and DAZN in USA, at the Manchester Arena. The vast majority of media members and boxing fans assume Usyk will outfox Bellew and then move up to heavyweight. Can Tony pull one last rabbit out of the hat or will Usyk’s Olympic pedigree rule the night? The last few years of Tony Bellew’s career has unfolded in a way few could’ve predicted. Back in 2011, Bellew had tasted defeat for the very first time dropping a majority-decision to Nathan Cleverly. In the spring of 2013 Tony fought to a draw with a wiley-vet in Isaac Chilemba. Bellew turned right around and beat Chilemba putting him in line for a shot at a WBC title against Adonis Stevenson. Stevenson wiped the floor with Tony scoring a 6th round TKO. Bellew moved up to cruiserweight a division that fit his body type much better and it showed. Tony strung together 6 victories eventually challenging Ilunga Makabu for a vacant WBC cruiserweight strap. The fight and victory was Tony’s finest moment, partly by winning a belt but mostly the fact it happened in his beloved at Goodison Park. Around 10 months later Bellew landed a huge opportunity at the heavyweight division versus David Haye. Haye had been inactive for around 4 years beyond 2 tune-ups. The world wondered not if Haye would win, that was a foregone conclusion, it was really what round Bellew would get starched. Bellew flipped the script not once but twice, stopping Haye in the rematch back in May to remove any doubts David’s injury was the main reason Tony got lucky in the first bout. Now, only time stands in the way of his attempt to gain glory personally and for his home country. The unified cruiserweight champion of the world, Oleksandr Usyk took care of business in the 1st season of the World Boxing Super Series. The former Gold Medalist hailing from the Ukraine has taken the professional ranks by storm. Glowacki, Gassiev, and Briedis all quality victories he’s accumulated in just 15 bouts. The odds are 100 percent stacked in favor of Usyk from a betting line standpoint, Bellew slated as a +570 on some sites. But let us not forget this event is being staged in the U.K. which obviously favors Tony Bellew. If a round is close or at least somewhat competitive, there’s reason to believe the judges will be swayed away from Usyk. This hack-of-a-scribe believes the outcome of this fight is predicated on Usyk’s approach. In Oleksandr’s fight with Michael Hunter and to a lesser extent Mairis Briedis, it was clear to see Usyk had heard the critics bashing his boring style and was blatantly fighting with a chip on his shoulder. 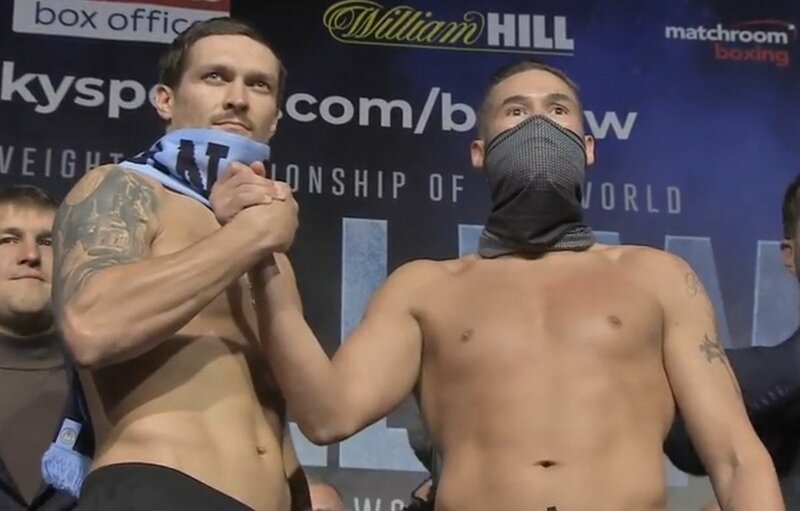 The pressure is all on Usyk and mapping out a plan to challenge Anthony Joshua before getting past Bellew could come back to bite him. Point blank, if Usyk is content to stay on the back foot and cruise to a point’s victory he will do just that. If Bellew gets out of character and becomes overly aggressive Usyk will pick him apart. If Usyk brings the fight to Bellew look for Tony to use his undervalued craftiness on the inside. Bellew may look like a couch potato but don’t let his average Joe appearance fool you, timing is a key weapon in the Liverpool natives toolbox. If the fight remains in the middle of the ring it still favors Usyk but note as wide. If Usyk stays close enough to Bellew, even on the outer edge of the pocket, Tony can close the gap and do damage on the inside. This fight will take a few rounds to warm up but once it does look for Usyk to have success with clean punching first. Bellew will need to have timed up Usyk and landed a meaningful left hook say 4 or 5 rounds in. If Tony is still guessing and confused by Usyk’s style it will likely be a one-sided unanimous decision for the Ukrainian. The biggest question mark is the large reach advantage Usyk’s holds and if Bellew can close the space. As long as Oleksandr remains poised and doesn’t fall for any of Bellew’s booby-traps, he should win the flush shots and footwork. Sure, Bellew will have some moments of success within individual rounds but he won’t be able to sustain it for long enough spurts. My Official Prediction is Oleksandr Usyk by Unanimous Decision.